Read for This Week’s Study: Acts 4:8-12; Acts 1:11; Matt. 25:1-13; Heb. 9:11, 12; Exod. 20:8-11; 1 Cor. 15:51-54. Memory Text: “Nor is there salvation in any other, for there is no other name under heaven given among men by which we must be saved” (Acts 4:12, NKJV). In 1888 Seventh-day Adventists experienced a period of intense debate over the interpretations of some key Bible texts. While pastors and church leaders were debating the identity of the ten horns of the prophecy of Daniel 7 and of the law in Galatians 3:24, few realized how their hostile attitudes toward each other destroyed their fellowship and friendship and thus marred the unity and mission of the church. Ellen G. White deeply deplored this state of affairs and encouraged all those involved in these discussions to think carefully about their relationship with Jesus and how love for Jesus ought to be demonstrated in our conduct, especially when we disagree. She also said that we should not expect everyone in the church to agree on every point of interpretation on all Bible texts. But she also emphasized that we should seek unity of understanding when it comes to essential Adventist beliefs (see Ellen G. White, Counsels to Writers and Editors, pp. 28-32). This week we look at some essential biblical teachings that make us Adventists and that shape our unity in faith. Study this week’s lesson to prepare for Sabbath, November 24. Although as Seventh-day Adventists we have much in common with other Christian bodies, our set of beliefs form a unique system of biblical truth that no one else in the Christian world is proclaiming. These truths help define us as God’s end-time remnant. Read Acts 4:8-12, 10:43. What importance does Peter give to the place of Jesus Christ in his understanding of the plan of salvation? The apostle Paul told the Corinthians that the good news is “that God was in Christ reconciling the world to Himself” (2 Cor. 5:19, NKJV). Christ’s death is our reconciliation with the Father, bridging the chasm left by sin and death. For centuries, Christians have pondered the meaning of Jesus’ death, resurrection, and the reconciliation He came to accomplish. This process of reconciliation has been termed atonement, an old English word that originally meant “at-one-ment.” This is a state of being “at one”, or in agreement. Accordingly, atonement denotes harmony in a relationship, and when there has been estrangement, this harmony would be the result of reconciliation. Church unity is thus a gift of this reconciliation. What What do the following passages teach about the meaning of Jesus’ death and resurrection? Though we hold this belief in Christ’s death and resurrection in common with many other Christian bodies, we proclaim it in the context of the “everlasting Gospel” (Rev. 14:6), part of the three angels’ messages of Revelation 14:6-12. As Seventh-day Adventists, we place an emphasis on these messages that no other Christian body does. How can you learn to keep before you at all times the reality of Christ’s death and resurrection and the hope that it offers? The apostles and early Christians considered Christ’s return “the blessed hope” (Titus 2:13, NKJV), and they expected all the prophecies and promises of Scripture to be fulfilled at the Second Advent. Seventh-day Adventists still hold firmly to this conviction. In fact, our name, “Adventist”, states it unequivocally. All who love Christ look forward with anticipation to the day they will be able to share face-to-face fellowship with Him. Until that day, the promise of the second coming of Christ exerts a unifying influence on us as God’s people. What do the following passages teach about the manner of Christ’s return? How does this differ from some of the popular notions of Christ’s return? Acts 1:11; Matt. 24:26, 27; Rev. 1:7; 1 Thess. 4:13-18; Rev. 19:11-16. The Bible repeatedly assures us that Jesus will come again to claim His redeemed people. When this event will happen should not be a matter of speculation, because Jesus Himself stated, “But of that day and hour no one knows, not even the angels of heaven, but My Father only” (Matt. 24:36, NKJV). Not only do we not know when Christ is coming back, we have been told that we do not know. At the end of His ministry, Jesus told the parable of the ten virgins (Matt. 25:1-13) in order to illustrate the experience of the church as it awaits His second coming. The two groups of virgins represent two types of believers who profess to be waiting for Jesus. Superficially, these two groups appear to be alike; but when the delay of Jesus’ coming occurs, the real difference between them becomes obvious. One group, in spite of the delay, had kept its hope alive and had made the adequate spiritual preparation. By this parable Jesus wished to teach His disciples that the Christian experience is not to be based on emotional excitement or enthusiasm but on a continuous reliance on the grace of God and perseverance in faith even when there is no tangible evidence of the fulfillment of God’s promises. Jesus invites us still today to “watch” and be ready at any time for His coming. Though our very name “Seventh-day Adventist” testifies to how crucial the Second Coming is to us, how can we on a personal level keep the reality of the Second Coming before us? How can we, as the years go by, not make the mistake that Jesus warned about in the parable of the ten virgins? In the Old Testament, God instructed Moses to build a tabernacle, or sanctuary, to serve as His “dwelling” here on earth (Exod. 25:8). Through its services, the sanctuary is where the people of Israel were taught the plan of salvation. Later, in the time of King Solomon, the portable tabernacle was replaced by a magnificent temple (1 Kings 5-8). Both the tabernacle and temple were patterned after the heavenly sanctuary, “the true tabernacle which the Lord erected, and not man” (Heb. 8:2, NKJV; see also Exod. 25:9, 40). Throughout the Bible, it is assumed that there is a heavenly sanctuary, serving as the primary dwelling place of God. The earthly sanctuary services were “miniprophecies” of the plan of salvation and of Jesus’ priestly ministry in heaven. Read Hebrews 8:6; 9:11, 12, 23-28; and 1 John 1:9-2:2. What do these passages teach concerning Jesus’ priestly ministry in heaven? Since His ascension, the heavenly sanctuary is the place where Christ conducts His priestly ministry for our salvation (see Heb. 7:25). Therefore, we are encouraged to “come boldly to the throne of grace, that we may obtain mercy and find grace to help in time of need” (Heb. 4:16, NKJV). As the earthly tabernacle had two phases of priestly ministry-first, on a daily basis in the Holy Place and then once a year in the Most Holy Place-the Scriptures also describe these two phases of Jesus’ ministry in heaven. His ministry in the Holy Place in heaven is characterized by intercession, forgiveness, reconciliation, and restoration. Repentant sinners have immediate access to the Father through Jesus the Mediator (1 John 2:1). Since 1844, Jesus’ ministry in the Most Holy Place deals with the aspects of judgment and cleansing that were done once a year on the Day of Atonement (Leviticus 16). The ministry of cleansing the sanctuary is also based on Jesus’ shed blood. The atonement performed on this day foreshadowed the final application of the merits of Christ to remove the presence of sin and to accomplish the complete reconciliation of the universe into one harmonious government under God. The doctrine of this two-phase ministry is a unique Adventist contribution to the understanding of the entire plan of salvation. Another crucial biblical teaching that Seventh-day Adventists believe and uphold is the seventh-day Sabbath. This is a key doctrine that brings unity and fellowship among us. It is one that, with very few exceptions in Christendom, we alone follow. The Sabbath is God’s gift to humanity right from the Creation week itself (Gen. 2:1-3). At Creation, three distinctive divine acts established the Sabbath: (1) God rested on the Sabbath, (2) He blessed the day, and (3) He sanctified it. These three actions instituted the Sabbath as God’s special gift, enabling the human race to experience the reality of heaven on earth and to affirm God’s six-day Creation. A well-known rabbi, Abraham Joshua Heschel, has called the Sabbath “a palace in time”, a holy day when God meets with His people in a special way. What do the following passages teach about the meaning of the Sabbath for humankind? Exod. 20:8-11; Deut. 5:12-15; Ezek. 20:12, 20. In our desire to follow Jesus’ example (Luke 4:16), Seventh-day Adventists observe the seventh-day Sabbath. Jesus’ participation in Sabbath services reveals that He endorsed it as a day of rest and worship. Some of His miracles were done on the Sabbath in order to teach the dimension of healing (both physical and spiritual) that comes from the celebration of the Sabbath (see Luke 13:10-17). The apostles and early Christians understood that Jesus had not abolished the Sabbath; they themselves kept it as well and attended worship on that day (Acts 13:14, 42, 44; 16:13; 17:2; 18:4) . In what very tangible ways has the Sabbath helped you experience the unity and fellowship that Christ desires for His people? Although people are born mortal and subject to death, the Bible speaks of Jesus Christ as the source of immortality and tells us that He gives the promise of immortality and eternal life to all those who believe in His salvation. “The gift of God is eternal life in Christ Jesus our Lord” (Rom. 6:23, NKJV). Jesus “has abolished death and brought life and immortality to light through the Gospel” (2 Tim. 1:10, NKJV). “For God so loved the world that He gave His only begotten Son, that whoever believes in Him should not perish but have everlasting life” (John 3:16, NKJV). So, there is hope of life after death. Read 1 Corinthians 15:51-54 and 1 Thessalonians 4:13-18. What do these passages tell us about life after death and when immortality will be given to human beings? The apostle Paul makes it clear that God bestows immortality upon people, not at the moment of death, but rather at the resurrection, when the last trumpet will sound. While believers receive the promise of eternal life at the moment they accept Jesus as their Savior, immortality is given only at the resurrection. The New Testament knows nothing of the idea of souls going off to heaven immediately at death; this teaching has its roots in paganism, going back to the philosophy of the ancient Greeks, and is not found in either the Old or New Testament. How does our understanding of death help us appreciate even more the promise of the Second Coming? How does this belief powerfully unite us as Seventh-day Adventists? Further Thought: Ellen G. White, “The Foundations, Pillars, and Landmarks”, pp. 28-32, in Counsels to Writers and Editors. Read the article “Doctrines, Importance of”, pp. 778, 779, in The Ellen G. White Encyclopedia. As Seventh-day Adventists we do share important beliefs in common with some other Christian bodies. The central one, of course, is belief in salvation by faith alone through the atoning and substitutionary death of Jesus. We, along with other Christians, believe that our righteousness is found, not in our own works but in Christ’s righteousness, which is credited to us by faith, an unmerited gift of grace. Or, as Ellen G. White famously wrote: “Christ was treated as we deserve, that we might be treated as He deserves. He was condemned for our sins, in which He had no share, that we might be justified by His righteousness, in which we had no share. He suffered the death which was ours, that we might receive the life which was His.” - The Desire of Ages, p. 25. At the same time, taken as a whole, our set of fundamental beliefs, and the practices and lifestyle that emerge from those beliefs, make us unique among the Christian world. That’s the way it should be, too; if not, why even exist, at least as Seventh-day Adventists? Our love of Jesus, and the teaching we proclaim, should be the most powerful uniting factor among us. In Faith and Works, p. 103, Ellen G. White equates justification with forgiveness of sins. How is an appreciation of our forgiveness and justification in Christ a basis for our fellowship and community with brothers and sisters? Think about how important our doctrines are in the context of church unity. That is, what has brought together millions of people from so many diverse ethnic, religious, political, and cultural backgrounds other than our shared doctrinal beliefs? What does this tell us about how important doctrine is, not just in the context of mission and message but for church unity as well? Our very name “Seventh-day Adventist” points to two crucial teachings, the seventh-day Sabbath and the Second Advent. One part of our name points to Creation, the other redemption. How are these two teachings related, and in what ways do they together so succinctly capture the essence of who we are as a people? Summary: Seventh-day Adventists hold in common many fundamental beliefs. Some we hold in common with other Christians; others not. Taken as a whole these teachings form our identity as a distinct church and are the foundation of our unity in Jesus. Jack Chen crawled along the ground in his rural home in central Taiwan until he was 5. Through daily physical exercises, he managed to build enough muscle to stand upright when he entered first grade. But he walked awkwardly on the balls of his feet, prompting teasing and taunts of “Freak!” from the other children. Sometimes, the boys spat him as they passed by. Jack was born with a leg disease that puzzled doctors. But Jack and his parents had no doubt about the cause: Someone had done something wrong in the family, and now they were being punished. “My family worships idols, and parents believed that we were being punished for something that they or our ancestors had done”, Jack said. When Jack was 12, a family friend suggested that Jack, who was lagging in public school, might have a better chance studying at a nearby Seventh-day Adventist school. Jack heard about Jesus for the first time when he enrolled in the seventh grade. He read the Bible for the first time. He decided at the age of 13 to give his heart to Jesus. The answer to his biggest question - why he was being punished for other people’s sins - came about a year later when he read of Jesus healing a man blind from birth. He read, “And His disciples asked Him, saying, ‘Rabbi, who sinned, this man or his parents, that was born blind?’ Jesus answered, ’Neither this man nor his parents sinned, but that the works of God should be revealed in him’” (John 9:2-3; NKJV). 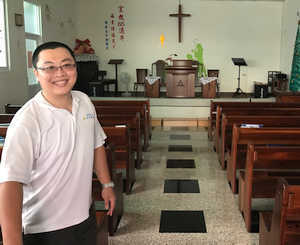 Jack went on to graduate from Taiwan Adventist College and now serves as a pastor in the coastal town of Jiading. He walks with a slight limp in one leg but otherwise functions normally. He is married and has two young sons.